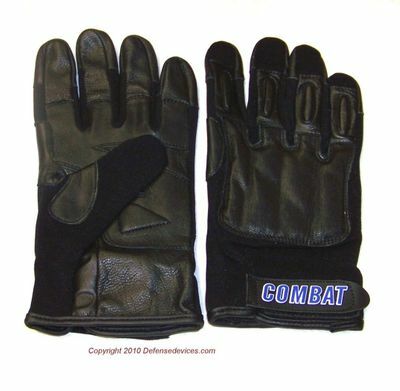 Genuine SAP Weighted Combat Gloves are made from soft, high-quality leather that can stand up to the rigors of martial arts training, biking or any other demanding purpose. Each knuckle features sewn-in steel shot to add weight and power to punches, and they are designed to protect your hands no matter what you are doing. They are even ideal for everyday exercising because they add a significant amount of weight to your hands. With built-in stretch nylon to provide a snug fit, as well as additional protection bars sewn between the second and third knuckles, these SAP steel shot leather gloves may be exactly what you need. Each is equipped with a Velcro tightening strap, which allows you to secure the gloves around your wrist. 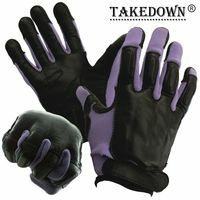 These gloves also have a triangular palm heel pad to provide you with added grip protection. Please check your local ordinances to ensure that the possession and use of weighted SAP gloves is legal in your area. DefenseDevices.com does not sell SAP gloves to residents of California, Massachusetts or New York.